How To Organize Family Room? Family room is the place where everyone gathers together. 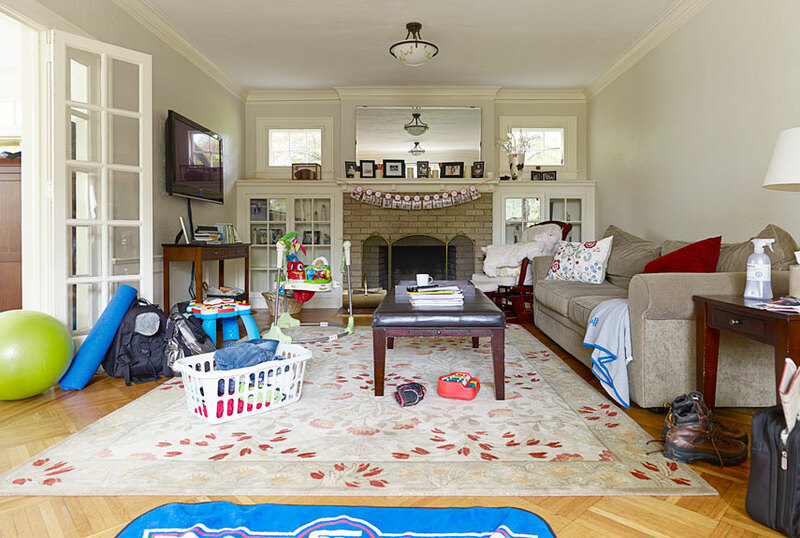 Unfortunately, after just a few weeks, the family room can really cluttered and chaotic. It is important for us to know how to create an orderly, comfortable and calm space in the family room. This is a place where the whole family can relax and entertain themselves. Before organizing the family room, we should know about its real purpose. There are different activities that family members may want to do in the room, such as watching movies, playing with children and reading books. Some may simply want to take a short nap, with air conditioner turned on and smooth jazz music playing quietly in the background. Regardless of what we want to do, there are specific details that we want to have in the family room. It means that we can organize the family room based on these purposes. We should be able to remove things that are not related to the original functions, such as ironing board, clothing, work laptops and shoes. For reading material, we may put newspaper, magazines and books inside the family room. For multimedia, we may put DVD, Blu-Ray, stereo, big screen TV and gaming desktop PC. There could also be toys and board games that we include the room. Various paraphernalia and photos could also enhance the interior design of our family room. Small objects can be placed in cabinets, drawers and baskets, based on specific categories; so it will be much easier for us to find them. By being organized, it is even easier for us to find things that we haven’t touched for years. We should know that using too many boxes will still create clutter, so we need to be prudent and avoid having too many items in the family room. It is quite likely that there are many things that we no longer use. We may sell them in garage sale or donate them to orphanage. Some magazines and newspapers can be recycled or given to people who still consider them useful. We should put the remaining items in order. Many families want to put as many as pictures inside the family room; but it’s quite possible that many of them are not appropriate. Unflattering, out of focus and duplicate pictures can be removed from our family rooms. Pictures should be arranged to achieve a balanced symmetry on the wall. They can also be grouped based on specific categories. This will allow us to arrange the family room based on comfort and specific functionality. If there are different activities that we want to do inside the room, we may need to assign different zones. As an example, there could be separate reading and gaming zones. Headsets can be used by anyone, if they don’t want to disturb others with loud noises or get disturbed by loud noises in the room. The family room needs to have ample light source, which allow for comfortable reading and playing. In some family rooms, there should be a large table to allow a comprehensive board game to be laid out for a long time, because each game session may need days or weeks to complete.